You unfold your body from the cramped car seat. You wiggle and stretch and walk a bit but still your low back is aching. Here are three versions of a classic stretch to ease low back pain. I consider all of these variations of Pigeon Pose: Kapotasana. In Pigeon Pose the upper leg bone is externally rotated and the knee is bent. Most people feel this stretch in the outer hip and deep hip rotators (between the sacrum and hip) Experiment and see which variation works best for your body. And don't save this stretch for travel. It is just as effective in your office in the middle of a long work day! Seated Pigeon: Sit upright on a bench or chair. Feet flat on the floor and parallel. Then bring one ankle to the opposite knee, ideally your lifted foot rests outside the knee rather than on the thigh. While you are sitting up tall encourage the knee of the lifted leg to gently drop away from your chest, thus increasing the external rotation of the thigh and opening up the groins. Do not force the knee, if you feel knee pain you've gone too far. If you have the flexiblity, gently fold at the hips to take your heart toward your shin. Keep some engagement in your deep abdominals. Repeat on both sides, as many times as feels good. Leaning Pigeon: Stand a foot or two away from a bench. 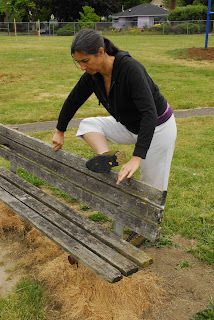 Bending one knee toward your chest, turn the thigh outward and bring the outside of the lifted foot to the bench in front of your standing thigh. 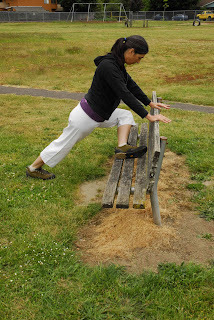 Continue to rotate the lifted thigh outward gently letting your knee fall toward the bench seat. Lean forward and place your hands on the bench back and form a plank with your body: ankles, hips and shoulders in a line. You'll want to continue to engage your deep abdominal and pelvic floor muscles and lengthen the sides of your waist and your spine. In this variation you may get a deeper hip stretch than in the seated variation, along with a stretch of the Achilles Tendon in the standing leg and some strengthening in the core torso muscles. Standing Pigeon: The hip stretch becomes even deeper if you bring the shin onto a surface at hip height. All the same cues apply: outwardly rotate at the hip; don't force the knee down; use the lift of your pelvic floor muscles and deep abdominals to lengthen your spine. Breathe. You might practice this variation with your leg on a picnic table or planter, your hotel room bed, or any surface. Try different heights to find where you can maximize your body's response. To take the stretch even further, take your hands on either side of the lifted foot and knee onto the surface your shin is resting upon, lean gently forward taking your heart toward your shin. You'll find the limit of your flexibility, don't push toward the very edge. Stay where the stretch feels optimal. Once you've completed whatever version of pigeon is right for your body, walk around some, then move onto the bench variations of dog pose found in the last post.